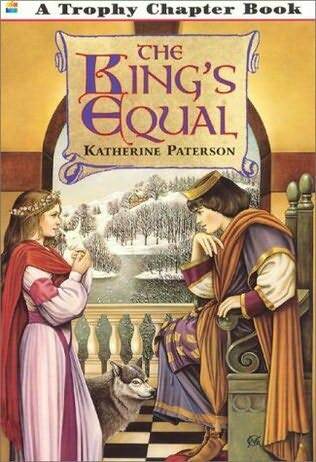 The King’s Equal by Katherine Paterson. HarperTrophy, 1992. Currently available. Genre: Fiction/fairy tale easy reader. Face Value: This book cover is designed to look like a traditional fairy tale, and it’s an accurate reflection of the story. I had to laugh at the cover of the book I picked up from the library. Even though this story is about Rosamund, the unusually gifted woman who is the only suitable mate for the prince, they slapped a barcode right on top of her face. On the version that I read, Rosamund is not even visible on the cover. The prince and wolf are clearly visible but you cannot even tell that the other character on the cover is a woman, except for a peek of her pink dress at the bottom. It is frustrating to see such careless placement of a barcode. Does it break the slate? It’s not a slate-smashing book, but there are certainly elements that challenge the typical gender roles that we see in most fairy tales. It is a more Slatebreaking option than most fairy tale and princess-themed stories. Who would we give it to? Fans of Brave will appreciate the themes of The King’s Equal. I would love to watch a parent read this book with their child and then discuss the gender roles presented within. It’s also a great contrast to traditional fairy tales, so it would be an excellent book to present to any young person studying fairy tales to show them how these types of stories can be written in a way that presents strong and intelligent females. Review: I am fascinated by the many ways in which people can challenge the status quo. There are those who speak loudly and make it boldly known that they oppose the way things have been. There are others who quietly and subversively make change that goes unnoticed until it builds into something big. Both approaches have an appropriate context, and both can be effective. When it comes to Slatebreaking books, I tend to like stories that boldly bust stereotypes. That’s why I was pleasantly surprised by The King’s Equal. It is a quiet but powerful book, cleverly using familiar fairy tale tropes in ways that challenge traditional gender roles. The story starts as many other fairy tales do: a prince is in need of a wife. All of the wisest court advisors are gathered to bring forth suitable candidates. When they all fail to live up to the arrogant prince’s expectations, the prince sentences his advisors to the dungeon and the kingdom falls into chaos. Meanwhile, there’s a humble, working class girl who is wise and beautiful and diligent. She encounters a magical wolf that encourages her to present herself to the court as a potential mate for the prince. She is successful, but there’s a twist: she refuses to accept the prince as he is now. Rosamund sends him away to spend a year living simply. The following year is a time of change and evolution for both characters. The prince has to reassess his value system and develop a work ethic. Rosamund grows from a quiet country girl into a capable leader. At the end of the year, they form a mutual partnership of affection and collaboration to lead together. Although this fairy tale still maintains a heterosexual romantic relationship as the heart of the tale, it does significant work in challenging gender roles. Rosamund is a more understanding and adept ruler than prince Raphael. After his year of solitude, prince Raphael is more comfortable with domestic tasks. It’s a nice alternative to fairy tales with female characters who never assert themselves. Rosamund’s shining moment happens when she stands before the prince and his male advisors and tells them that she won’t marry him simply because she’s deemed worthy. He has to prove his value, too. It’s that simple example of relationship equality that makes this book a worthwhile addition to the reading list of any young reader with a penchant for fairy tales. This entry was posted in Middle Grade, Reviews and tagged Brave, Fairy Tales, gender roles, Princesses. Bookmark the permalink.